Today I want to share my thinking process for setting smart business goals with you. I like to work backwards from a financial goal all the way down to daily to-do lists. Every smart business goal should be quantifiable, as in have a specific number attached to it. In this way, you can measure your success rate, and see what and if you need to tweak your approach. So here’s how that works: It always starts with a money goal. Because let’s face it, business success is tied to revenue, pure and simple. It helps if that goal has a meaning beyond the dollar figure. This helps to keep us motivated on the end goal! For example, let’s say that I want to buy a new car. The monthly payment is around $400. To account for things like taxes and just to be safe, I’ll bump the goal up to $600. In other words, I need to add an extra $600 (or more… more is always better) to my monthly bottom line. Once that’s done and I am seeing that level of income on a regular basis, I’m ready to order my new car. Once I know how much money I have to make, I can start to think about different ways to do just that. I could find more customers for one or several of my existing products. 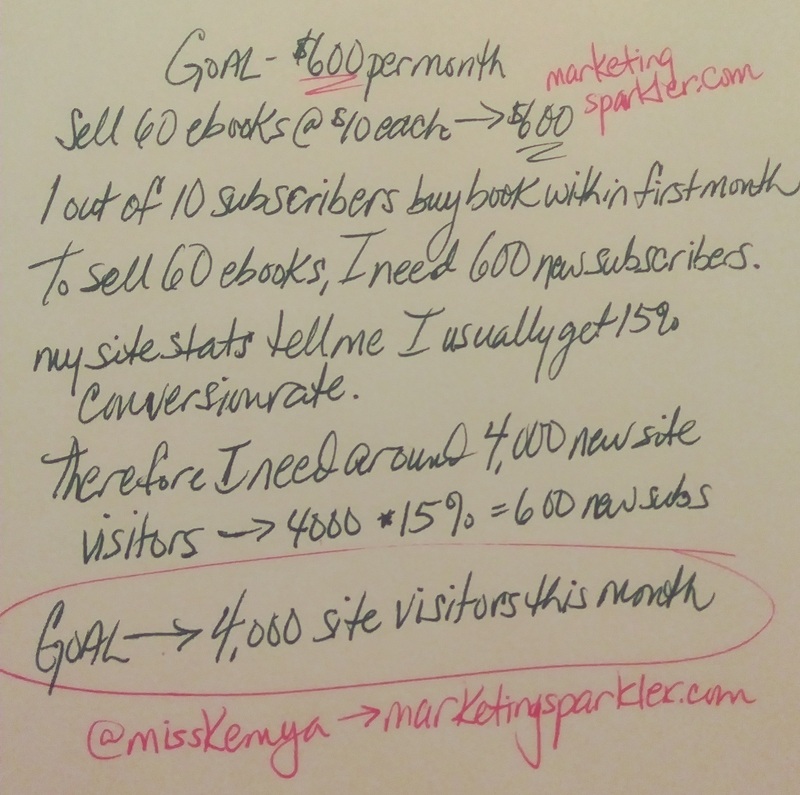 For example, if I have a $10 eBook, I would have to make an extra 60 sales per month. From there I can work backwards. If I know that on average one out of 10 email subscribers buy the book within the first month of signing up, I need to add 600 new subscribers to my list. I know this takes roughly 4,000 new visitors to my website because I know my conversion rate is around 15%. That’s why you measure such things – see previous post “Increasing Traffic, Subscribers & Customers To Boost Your Bottom Line” for more details on this. If this is my plan, I know that my daily to-do list needs to include plenty of action steps to ramp up my traffic by an extra 4,000 people per month. Since the car payment will be an ongoing thing, it also makes sense to look into recurring payments. This could be my own membership, or I could look into affiliate offers with recurring commissions. Depending on your market, there’s a lot out there that you can promote. Once I reach that number, I only need to add the occasional new member to balance out cancellations. Getting one or two more members in each month going forward should more than cover that. Now I have a concrete goal to work towards which is convincing 16 people to sign up for the membership. My daily tasks will include things like creating content that includes an offer to join the membership. Or, I can write a short opt-in report about using the CLP templates. This will help me build a targeted list of people interested in DIY marketing to build their business. Then I can start driving traffic to the content and the opt-in offer and start mailing regularly about the CLP membership. I may even craft a short autoresponder sequence to create an evergreen funnel. Of course this is just the tip of the iceberg. I could approach a few influencers or existing customers to see if they would be interested in promoting the membership. Maybe I can get them to write some guest blog posts, answer some questions for an interview style post, or even do a webinar. All of these would of course promote the Create Launch Profit membership. By thinking outside the box and putting in some time and effort initially, it won’t take me long to get those 16 signups that pay for my new car payment. Because I really want that new car, I’m going to be motivated to get it done and grow my business by an extra $600 per month. In fact, chances are great that I’ll overshoot the goal by several hundred dollars. Even better, this is something I can continue to grow month after month. 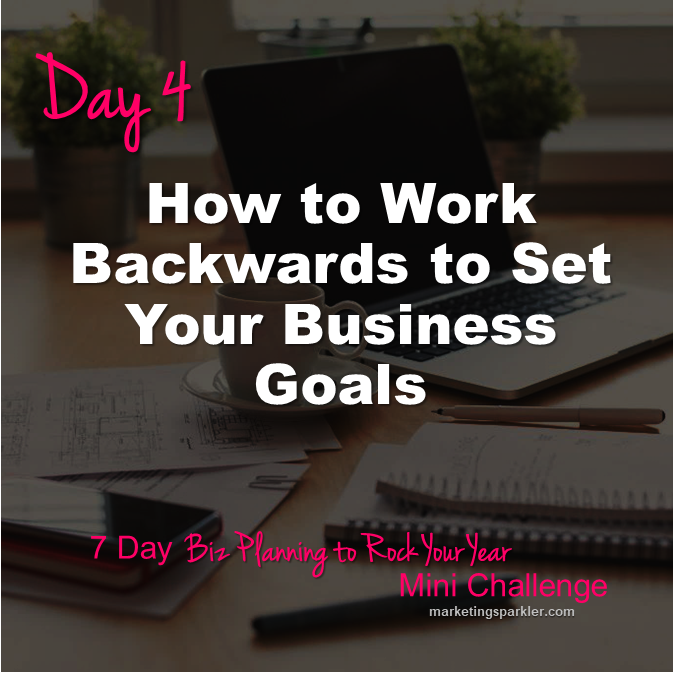 This is Day 4 of the 7 Days of Biz Planning to Rock Your Year Mini Challenge, a free, 7-day series for entrepreneurs that can be started at any time. Register and each day you’ll get an email from me with tip or a strategy designed to help you make plans for growing your business. We’re not talking fluff-n-stuff here. These are hands-on, actionable tips and strategies you can use every day to embrace planning, set ambitious goals, and then work towards reaching them. Click here to sign up for the full challenge.